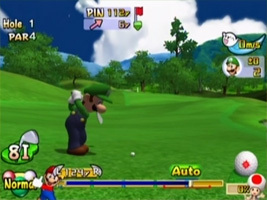 A golf game on the GameCube featuring Mario and friends as they tee off across the Mushroom Kingdom. Play across tranquil greens or over obstacle course set off in some familiar locations. You can view where the ball will land and adjust your shot. The drive and accuracy of your shot it determined by a power meter. Take into account the wind and avoid the water hazards, sand traps and other obstacles. You can also play through a selection of golfing minigames, each with their own rules, such as hitting the ball through rings on the course. 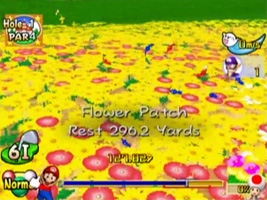 On the Peach's Castle Grounds levels you sometimes see yellow flowerbeds. Hit your ball into one of them to throw up a small group of red, yellow and blue Pikmin.